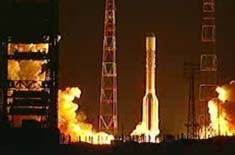 A Proton rocket launched overnight Thursday with a Russian defense ministry satellite to relay communications between troops and military commanders. 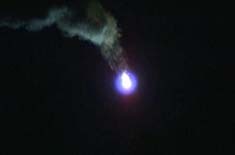 The silver launcher blasted off at 0018 GMT Thursday (7:18 p.m. EST Wednesday) from the Baikonur Cosmodrome in Kazakhstan, kicking off a nine-hour mission that included multiple burns of the Breeze M upper stage. 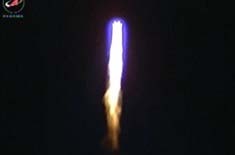 The Proton thundered into crystal clear skies and shed its first stage about two minutes after liftoff as planned. The second and third stages completed their roles in the launch 9 minutes into the flight, before giving way to the Breeze M upper stage. The Breeze M deployed the military satellite around 0919 GMT (4:19 a.m. EST) Thursday, and Russia declared the launch successful. 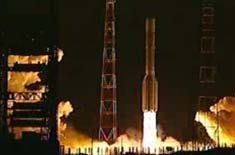 The payload is believed to be a modernized Raduga, or Globus, communications satellite designed to link Russian troops and senior military commanders. The spacecraft can relay messages through small mobile terminals deployed on the battlefield, Russian defense officials said. The Raduga fleet is stationed in geosynchronous orbit 22,300 miles above Earth. Raduga satellites are built by NPO PM and are also used by high-level government officials to communicate across Russia. 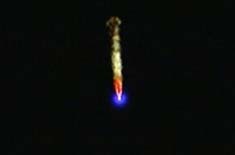 The Proton flight marked Russia's first space launch of 2010, and it was the second launch to reach orbit so far this year. Another Proton mission is on tap for Feb. 12 with the Intelsat 16 commercial communications satellite. That launch will be conducted under the management of International Launch Services.